Do you have a waterproofing membrane that I can attach timber frame to? Yes we have the baseline 8 membrane; you fix the studs to the basement membrane plugs for dry-lining the walls. What size is the baseline 8 membrane available in? The baseline 8 membrane is available in two sizes, 2x20 (40m2) and 2 x 2.4m (48m2). Can I use the baseline 8 membrane on the floor? Yes baseline 8 membrane is suitable for floors. What is the spacing’s for the membrane fixings? You should work from the centre of the membrane outwards and the fixings should be spaced at 600mm centres (400mm centres if studs dictate this) horizontally and vertically. What type tape do I need to join slim line mesh membrane? In order to join slim line mesh membrane you will need the Fibre tape. Do you have local stockists in London? We do not supply through third parties. All our products are in stock-order direct and we will ship as per your instructions. If I purchase Dampcure 380, do I have to buy the nozzle as a separate item? No if you order Dampcure 380 one free nozzle is free of charge with each order. Will these remedial cavity wall ties work on hard Victorian bricks found on houses built around 1905? Yes although if the bricks are engineering or semi-engineering you may need a 7mm pilot hole, otherwise you will be ok with a 6mm pilot hole. What colour is epoxy floor seal paint? Epoxy floor seal paint comes in two finishes, Clear Gloss or Grey Finish. What depth of slot do I grind out to put the crack stitching tie in? In a masonry wall of 102mm the slot should be 30mm, in a masonry wall of 215mm the slot should be 45mm. Do I have to fill the slot with masonry repair grout? No you can recess the grout and then fill the slot with the same coloured mortar to match the rest of your brickwork. How much of Brunopel Iwp do I add to my render coat? You should mix 1 part Brunopel to 30 Parts water in a 3:1 sand and cement backing coat. Which gun do I use for the Polyester Injection Resin? You will need a co-axial resin dispensing gun. 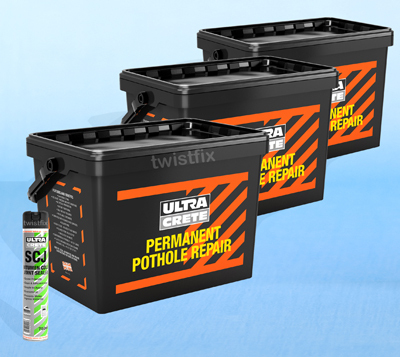 What is the coverage rate of a 25kg tub of pothole repair? The coverage is 1m2 x 15mm compacted. For more information on damp proofing, basement waterproofing or if you require any advice then contact us on 0845 1236007 or email info@twistfix.co.uk.